The seventeenth-century Frenchman John Baptist de la Salle was drawn to what he discerned as God’s will for him be abandoning all earthly things. He was capable, from a noble family, good looking and yet the entitlements of society were insufficient for his heart. John was ordained at 27 and was offered place among the canons at Rheims which he later gave up. We believe that Divine Providence shows us the path to walk by putting people and circumstances in our way as pointers to serve Him and Him alone. The events of his era led John Baptist and others to take seriously the work of mercy educating young men, especially the poor. The charism of educating the poor was so attractive that men who desired to serve the Lord and the Church a brothers and not priests gave way to the founding of a community of religious men called the Brothers of the Christian School (Christian Brothers, or De La Salle Brothers and sometimes the French Christian Brothers). Over time the work was more defined by educating boys of poor families, training teachers and setting up homes and schools for delinquents of the wealthy. It was John’s desire that the men in his care would be become a good Christian men. De La Salle had lived his final years with chronic asthma and the painful rheumatism giving himself totally to God on Good Friday. He was 68. 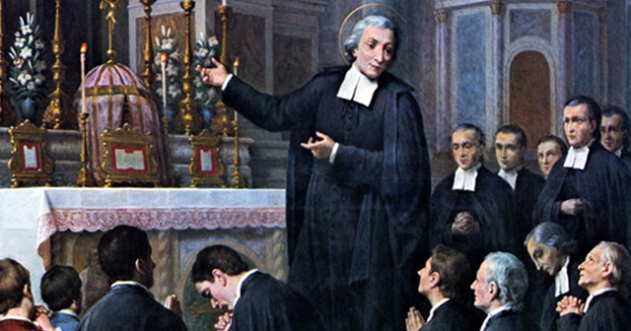 The Church canonized Father John Baptist de la Salle in 1900 and in 1950, Pope Pius XII named de la Salle patron of schoolteachers.